This library of Node-RED nodes enables you to build a powerful and flexible Interactive Voice Response (IVR) telephone system with Twilio and Node-RED. 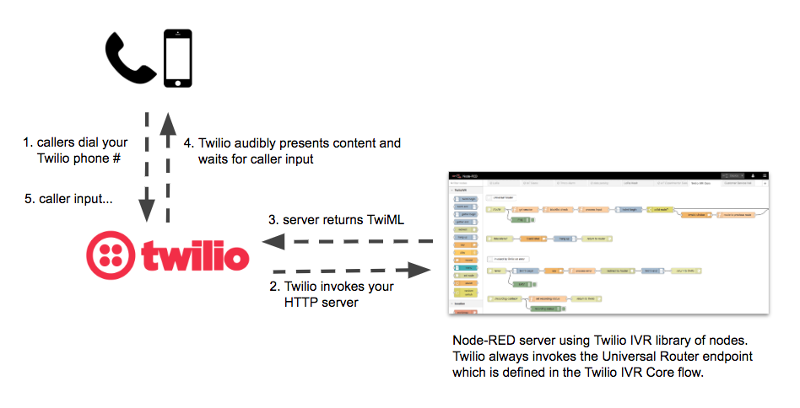 This README assumes you have experience with Twilio and Node-RED, but there is a much more comprehensive article here which gives a detailed description of how it all works. The nodes in this library create the TwiML markup for Twilio to present to the caller. You will also need to create a Node-RED flow for the Twilio IVR Core which handles incoming requests and properly routes the call based on the caller's input. The Universal Router is the HTTP endpoint /router. In your Twilio account, you will need to configure your phone number to invoke the HTTP endpoints defined in the IVR Core flow. These nodes can be assembled together to create TwiML response documents. Many correspond directly to TwiML tags, but the 'menu' node is more complex and creates the TwiML content for a whole menu. 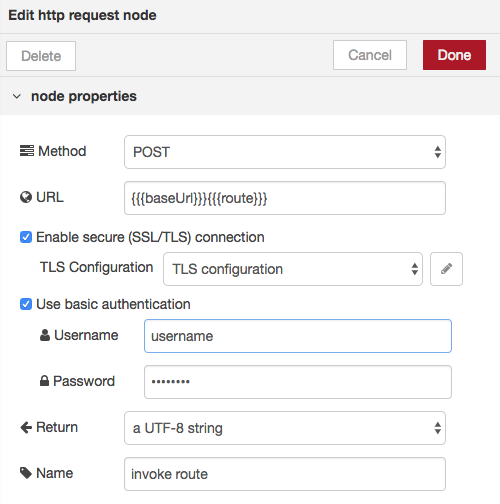 In the HTTP request node called "invoke route", update the configuration to fit your server's security configuration. That is, whether TLS/SSL is used, and the your Node-RED HTTP node username/password credentials. In your TLS/SSL configuration, you may need to uncheck the checkbox "verify server certificate". Download the audio file bundle and host on a web server or in an AWS S3 bucket. IVR nodes of type "menu" and "play" have a configuration item for the audio file base URL. Set this to the URL where your audio files are hosted. The modules on this site are automatically indexed from npm. If you have a concern about this module, please let us know. For example, if you believe it contains unsuitable or inappropriate material. This is not the place to seek help with the module - for that, please contact its maintainers directly. 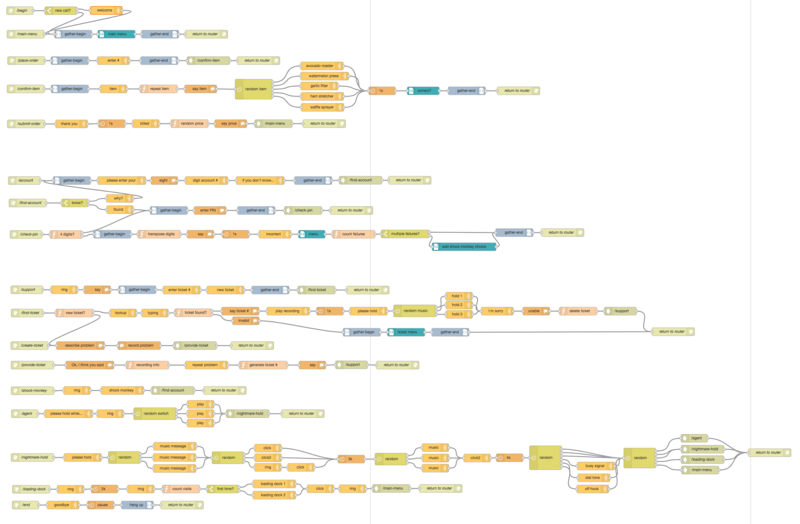 Node-RED is a visual wiring tool for the Internet of Things. A project of the JS Foundation.